Tej Sahota was born in Clearwater, B.C. and spent most of his childhood in Edmonton, Alberta before moving to Brampton, Ontario in 1991. After graduating from Heart Lake Secondary, he went on to complete a 4 year B.Sc degree in Human Biology at the University of Toronto. 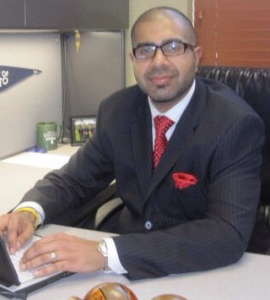 Beginning in 2004, Tej attended the Ohio College of Podiatric Medicine (now the Kent State University College of Podiatric Medicine) and graduated with a 4 year medical degree of Doctor of Podiatric Medicine. During this time he interned under some of the most renowned foot and ankle surgeons at the prestigious Cleveland Clinic and St. Vincent Charity Medical Center. Post graduation, Tej did a 3 year advanced surgical residency at the Summa Western Reserve Hospital in Akron, Ohio. During his surgical residency, Tej trained to perform advanced traumatic reconstruction of the foot and ankle, correction of pediatric deformities (clubfoot) and open fixation of fractures and tendon procedures. Tej has also performed thousands of procedures for correction of cosmetic deformities, such as bunions, cysts and hammertoes. Tej has trained with the use of arthroscopic surgical procedures as well as minimally invasive surgical techniques including platelet rich plasma procedures for athletic injuries. 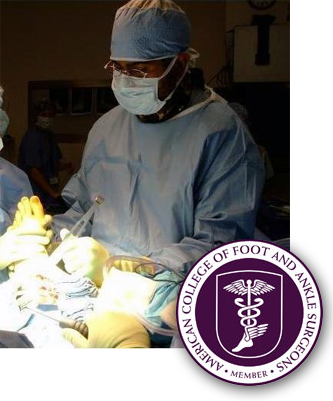 This level of advanced training earned Tej an Associate status with the prestigious and standard bearer American College of Foot and Ankle Surgeons (ACFAS). Upon completion of residency, Tej Sahota worked as an associate with the Ohio Foot & Ankle Center in the Akron/Canton area. In addition to this role, he also served as an Externship Director at the Summa Western Reserve Hospital and served as adjunct faculty at Ohio University College of Osteopathic Medicine, Kent State University College of Podiatric Medicine and D’Youville Chiropractic College. In addition to his role with the Ohio Foot & Ankle Center, Tej served as an on-call foot and ankle surgeon with 4 area hospitals in Northeastern Ohio, along with serving at two wound care clinics, specializing in diabetic limb salvage. In 2013, with a beautiful addition of a baby boy to their family, Tej and his wife Ruby made the move back to southern Ontario and settled back in the Brampton area. Upon certification as chiropodist with the College of Chiropodists of Ontario, Tej joined on to Markham Podiatry that same year before moving into the position of our lead clinician in 2015. Tej serves as Vice President of the Ontario Podiatric Medical Association, along with being Senior Faculty for the Canadian Assocation of Wound Care. He has also served on the medical team for the 2015 Pan Am Games in Toronto as Podiatrist to the competing athletes. He is currently serving as the team Podiatrist to the Montreal Canadiens ECHL affiliate, the Brampton Beast. In his spare time, in addition to spending time with his beautiful family, Tej enjoys trying to survive on the basketball courts, ball hockey rinks and learning how to avoid 3 putts on the golf greens.